Walking my talk about self-care + Happy Fall! Maybe the hardest thing for me about going through a time of heightened activity (or, insanely heightened activity) is coming down from it all. After the last couple of months of transitioning from my old home to the new one — and the accompanying “too much to do” feeling on a daily basis — things are starting to settle down just a bit. And I’ve actually found myself at loose ends on certain days. My mind and body have gotten used to “too much to do.” It’s that “coming down from the adrenaline of momentum” feeling that I’ve written about before. The adrenaline that helps us to get through the period of heightened activity actually starts to feel normal to us. This is where I can get into trouble if I don’t pay attention. Last week Saturday was the first day I really took an opportunity to fully catch my breath — and it felt wonderful. But the very next day, I noticed myself overscheduling and stuffing in activities here and there because, why not? I’ve gotten used to having too much on my plate. And noticing this in myself clued me in to the fact that I’d fallen for it all over again — our culture’s glorification of “busy”. Remember that saying, “If you need to get something done, give it to a busy person”? I heard that often from my parents and teachers when I was growing up, and again in college, and, heck, somebody just said it to me the other day. And to a degree, being busy feels good and IS good, as long as we are occupied with things that are meaningful to us and notice our need to rest. But there’s something insidious in the way we praise “busy”. We apologize for being “so busy”, and yet it also seems to give us some kind of quick validation. We’re busy, therefore we must be important, we must have value. And: being super-busy also gives us a good reason to (finally) take a huge time-out and take care of ourselves. But what if we didn’t need a “good” reason, or any reason at all? What if noticing our need to rest and then our need to be active and then our need to rest again, was simply part of our daily lives, part of our ongoing self-care? What if this kind of self-care was a must, a foundation for our lives, rather than something we have to hit a (sometimes very painful) wall to finally allow in? For the past several months, I’ve been leading clients through my Stellar Self-Care program, which I created because I recognized that far too few of us truly anchor self-care into our lives at the foundational level. We wait until we’re in so much physical, mental or emotional pain that we simply can’t ignore the part of us that, ultimately, cannot be denied if we actually want to thrive and not just cling by a thread to survival. And, here’s the thing I came to: I wasn’t walking my talk. I’d been seduced by the idea that I would practice better self-care after my move was over. When things calmed down. When things got less hectic. In these past few days, I’ve reminded myself that it’s okay to feel at loose ends as my body adjusts to living life in a less heightened way. It’s okay to let go of activities that I’m tempted to “schedule in” but simply don’t feel necessary. One thing I’ve learned while working with people in this new program is that we all have a tendency to turn self-care into “one more big to-do on the list.” And that’s exactly what I did when I starting telling myself I’d take better care of myself when the move was over. I already had such a giant to-do list I felt like I couldn’t possibly take on any more. And I was right. I couldn’t. If we can intervene before we get to that point, we absolutely should. And right now, as I’m writing this post, I’m noticing that part of me that is feeling like it’s pushed hard enough and is ready to stop. It’s saying “enough for today”. I’d love to hear how YOU take care of yourself before getting to the “fight, flight, freeze” point. And you can learn more about my Stellar Self-Care program here. 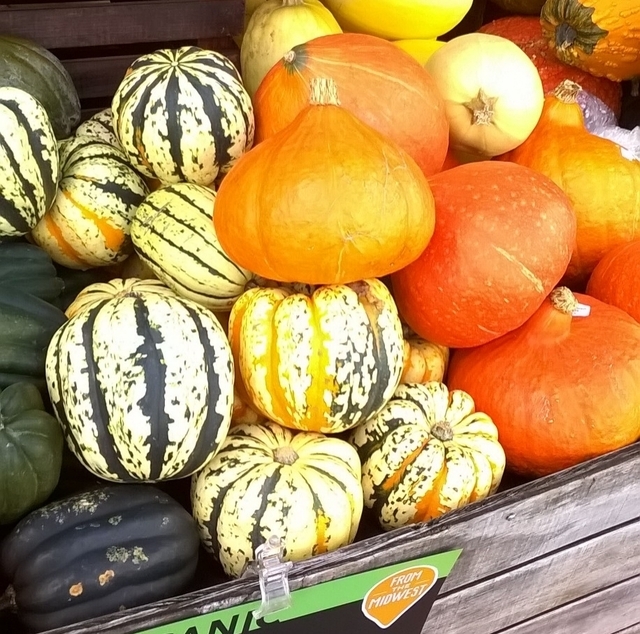 Gorgeous gourds: confirmation that fall has arrived! My good friend, artist, writer, and creativity consultant Dawn Herring, interviewed me about journaling for one of her “Creative Conversations”. I had a terrific time chatting with Dawn (she got me thinking and making connections between my journaling and the rest of my life that I don’t know if I’d have gotten to otherwise!). Fall is here! 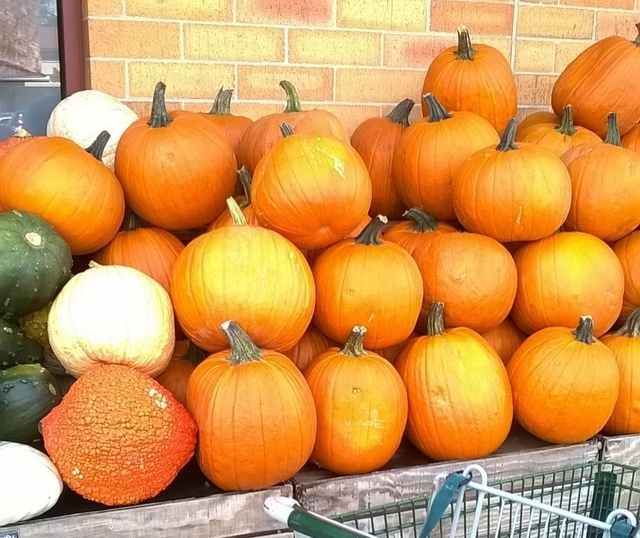 The pictures accompanying this post are gourds I saw on one of my walks this week. I wish you the spaciousness to relish this gorgeous season as it sweeps in. I love what you said about the real ‘to do’ being to shift your relationship to the list. That feels really good. I have been practicing for quite a long time doing things in a kind of flow state – when they come up, they get done, or done as much as they can be at that time. It doesn’t always work but everything does actually get done, so a list is not as necessary. It helps to reduce that urgent feeling too.